^ a b "Land Areas of the National Forest System". U.S. Forest Service. November 2014. Archived from the original (PDF) on January 6, 2015. Retrieved January 6, 2015. ^ a b Dant Ewert, Sara E. (Summer 2000). 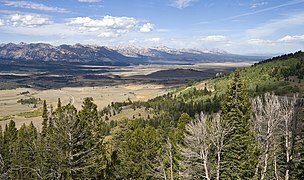 "Peak park politics: the struggle over the Sawtooths, from Borah to Church". The Pacific Northwest Quarterly. Seattle, WA: University of Washington. 91 (3): 138–149. ISSN 0030-8803. JSTOR 40492581. ^ a b Landers, Rich (August 4, 2015). "Idaho's Boulder White-Clouds Wilderness Approved". The Spokesman-Review. Archived from the original on August 4, 2015. ^ a b Simpson, Mike. "H.R. 1138". U.S. Congress. Archived from the original (PDF) on August 4, 2015. 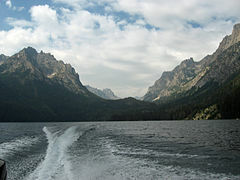 ^ a b "Sawtooth National Forest". U.S. Forest Service. Retrieved August 12, 2015. ^ a b c d e Sawtooth National Forest (Map) (2012 ed.). 1:126,720. Sawtooth National Forest, U.S. Forest Service. ^ US & Canada, BBC News (18 November 2010). "Scientists find new seismic fault in Rocky Mountains". British Broadcasting Corporation. Retrieved 20 November 2010. ^ Wall, Tim (November 19, 2010). "Large Seismic Fault Found in the Rockies". Discovery News. Retrieved 20 November 2010. ^ Lopez, T. (October 1, 2000). Idaho, a climbing guide: climbs, scrambles, and hikes (2nd ed.). Seattle, WA: Mountaineers Books. ISBN 978-0-89886-608-7. 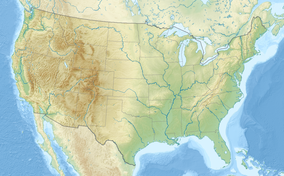 ^ "U.S. Board on Geographic Names". USGS. Retrieved May 9, 2012. ^ Ring, Ray (May 27, 2002). "Wolf at the Door". High Country News. Archived from the original on February 12, 2013. Retrieved August 26, 2012. ^ Merrill, Troy; Mattson, David J.; Wright, R. Gerald; Quigley, Howard B. (February 1999). "Defining landscapes suitable for restoration of grizzly bears Ursus arctos in Idaho". Biological Conservation. Elsevier. 87 (2): 231–248. doi: 10.1016/S0006-3207(98)00057-3. ISSN 0006-3207. Archived from the original (PDF) on February 12, 2013. ^ Isaak, Dan; Rieman, Bruce; Horan, Dona (April 2009). "A watershed-scale monitoring protocoal for bull trout". Fort Collins, CO: Rocky Mountain Research Station, U.S. Forest Service. Archived from the original (pdf) on February 12, 2013. Retrieved May 21, 2012. ^ "Focus: Bull Trout Monitoring". Rocky Mountain Research Station. Archived from the original (pdf) on February 12, 2013. Retrieved May 11, 2012. ^ Rember, John (2003). Traplines: Coming Home to Sawtooth Valley (1st Pantheon ed.). New York: Pantheon Books. ISBN 0375422072. OCLC 50604950. ^ Heumann, Joseph K.; Murray, Robin L. (2004). "Pale Rider environmental politics, Eastwood style". Jump Cut (47). Archived from the original on February 12, 2013. Retrieved May 22, 2012. ^ "Film Review: Alpha and Omega". Film Journal International. September 17, 2010. Archived from the original on February 12, 2013. Retrieved January 16, 2012. ^ Bell, Anthony and Gluck, Ben (Directors) (September 17, 2010). Alpha and Omega (film). Lionsgate. ^ McCarthy, Rebecca (August 1, 2010). Alpha and Omega: Kate and Humphrey's Big Adventure. New York, NY: Scholastic. ISBN 978-0-545-21460-5. ^ "Personalized Plates for Your Vehicle and Souvenir Sample Plates". Idaho Transportation Department. Archived from the original on February 12, 2013. Retrieved May 11, 2012.